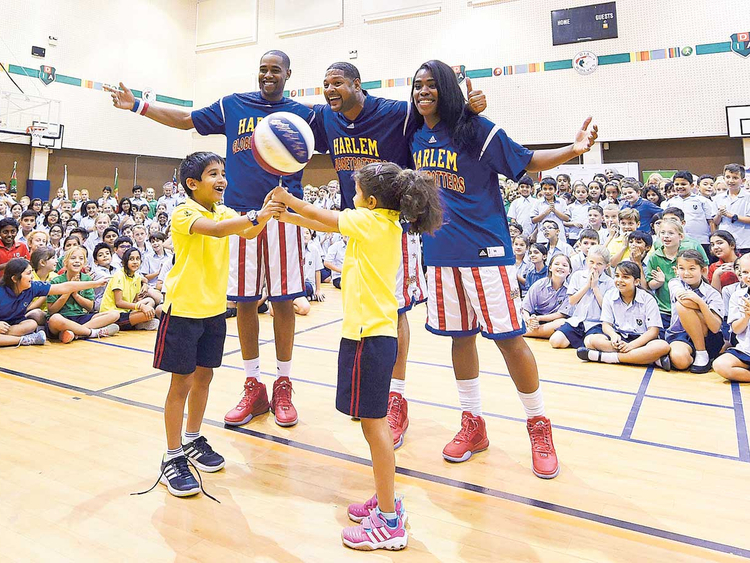 Dubai: Hundreds of star-struck Dubai schoolchildren cheered while learning the ‘ABCs of Bullying Prevention’, as well as some basketball tricks, from the world-famous Harlem Globetrotters on Monday. 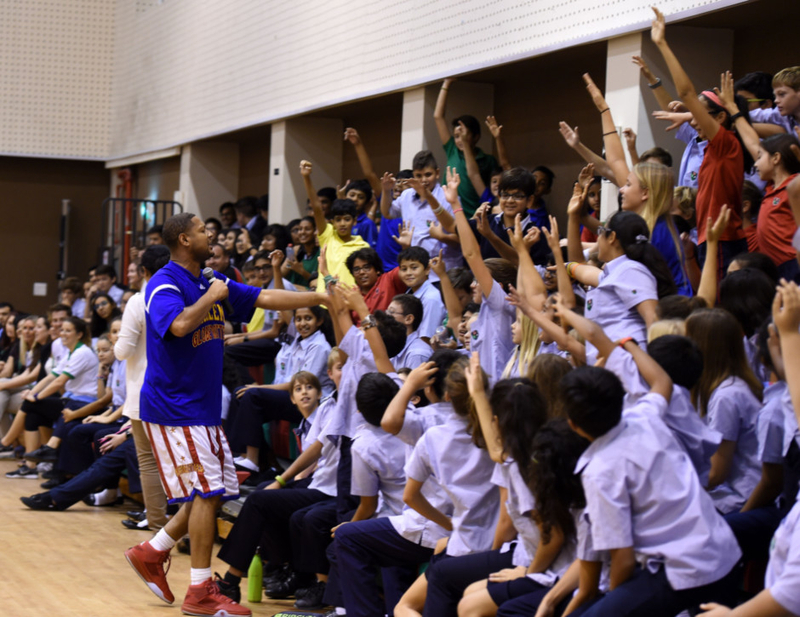 Three members of the American basketball sensation visited Dubai International Academy (DIA) to raise awareness on anti-bullying in their signature style, filled with humour, trick shots and a strong message. Through interactive games, the team showed around 600 children the ABC of combating bullying. A is for Action, as in taking action by notifying an adult at school or home about any bullying incidents. B is for Bravery, in demonstrating courage to “walk away from bullies. What bullies want is attention — so pay them no attention”. And C is for Compassion, in showing care for victims of bullying. Children, mostly aged eight to 12, chanted “bullying is not cool” as they passed through different stages of the activities, led by the Harlem Globetrotters team, comprising Chris ‘Handles’ Franklin, Cheese Chisholm and Fatimah TNT Lister. 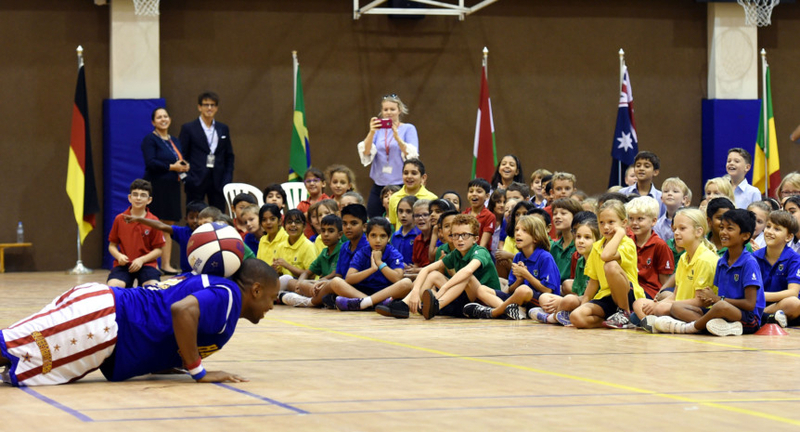 Franklin, on his first visit to Dubai, said children need positive role models they can learn from, adding it was also important to listen to them so they can “start speaking up against bullying”. Franklin inspired the students to “believe in yourself”, describing how he made it his dream to join Harlem Globetrotters after seeing them in a cartoon as a child. Bullying is taking on new forms, such as cyberbullying, and although DIA has a clear policy regarding bullying, “it also helps when it’s someone famous reinforcing the important message”, said Tim Richardson, head of primary school at DIA. “It’s important for children to know bullying victims are not alone. They need to come and talk to a teacher or a school counsellor. And they need to know they will be listened to if they come to us, to take action on their behalf,” he added. Monday’s event coincides with the Harlem Globetrotters 90th Anniversary Tour to Dubai on October 28 at the Dubai Duty Free Tennis Stadium. The DIA awareness session follows last week’s announcement by Abu Dhabi Education Council (Adec) regarding a new Child Protection Policy, designed to identify and support students who may have been subjected to abuse or neglect, including bullying. School staff in the emirate of Abu Dhabi must now be very vigilant regarding child safety, and report cases in which they suspect any abuse has occurred or neglect has taken place. The new Adec regulations follow the implementation of the UAE Federal Law No 3 of 2016 on Child Rights, which came into force in April this year.